The website of the Project for the New American Century went offline last month, spurring conspiratorial rumors regarding the once-prominent neoconservative group, which had been a vocal proponent of regime change in Iraq before and after 9/11 and had displayed a knack for coalition-building across the political spectrum. Though its former executive director says the dead website is due to a forgetful accountant, PNAC’s loss of support reaches beyond the technical. For the many critics who see the Iraq War as PNAC’s primary legacy, it is tempting to see the lapsing of the group’s website as the latest example of pro-war neoconservatives fleeing from their mistakes. With many former Bush administration officials and advisers (some from the PNAC orbit, like Richard Perle and Kenneth Adelman ) attempting to distance themselves from the failures in Iraq, it seems reasonable that whoever remains in charge of PNAC’s website might be attempting to quietly scrub the Internet of evidence of the organization’s famous proclamations and open letters, many of which now read like arrogant anachronisms. “Just as the neocons are attempting to run from responsibility for the Iraq War, it appears PNAC may be abandoning its own website,” observed a blogger at the Center for American Progress, typifying reaction on the left. For PNAC watchers, that the website went offline produced no shock—although the fact that the organization still has an accountant might. PNAC ceased day-to-day operations in 2005, after it issued its final open letter calling for more U.S. forces in Iraq. 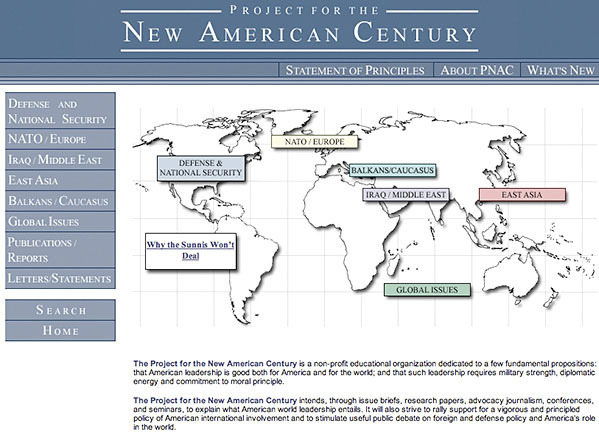 Before finally going blank last month, the PNAC website had been gathering cyber-dust for over a year, serving as a sort of online repository of neoconservative thinking, an archive of support for the “war on terror” and other causes. Many of the signatories to this and other PNAC letters would go on to join the George W. Bush administration—including Richard Armitage, Paul Wolfowitz, Zalmay Khalilzad, and Donald Rumsfeld—and turn what were private views into national policy. Other signatories, notably Francis Fukuyama, would break with their colleagues and eventually denounce the PNAC vision of a Pax Americana maintained by preventative, unilateral force. Although those who signed its statements were frequently from the Right, PNAC displayed a knack for coalition-building that reached across the political spectrum. Examples of signatories from the Left or Center and the statements they supported include Mort Halperin (on removing Slobodan Milosevic from power), Madeleine Albright (on NATO and the EU), and Steven Clemons (on Hong Kong’s freedom). Growing distaste for PNAC’s interventionist agenda coincided with the mounting costs of the occupation in Iraq, and as America’s strategic position declined, PNAC’s activities came to a halt. In its last letter, dated January 28, 2005—almost exactly seven years to the day after it first called for regime change in Baghdad—PNAC signatories urged Congress to increase the size of the active duty Army and Marine Corps for the express purpose of fulfilling America’s “generational commitment” to the U.S. “engagement” in the Middle East. Less than a year later, shortly before the 2006 midterms and the subsequent resignation of Secretary of Defense Rumsfeld, the organization had gone quiet. That job may have been symbolized by the invasion of Iraq, but PNAC’s mission was broader than simply bringing down Saddam Hussein; it was also heavily rooted in America’s pre-9/11 political culture. As first explained by PNAC founders William Kristol and Robert Kagan during the 1996 presidential election, it was necessary to attack and break up a “tepid consensus” on U.S. foreign policy that had zombified both parties and the American public since the end of the Cold War. Kristol and Kagan were horrified by America’s inward-looking debates and what appeared to be a complete lack of interest in geopolitics. They considered the approach by the two parties during the 1990s to be small-minded and shortsighted, civically enervating and suicidal to U.S. national interests and values. At first, their main targets were not Democrats, but “McGovern Republicans” within the GOP who sympathized with the isolationism of Pat Buchanan more than the imperial zeal of their hero Teddy Roosevelt. Kristol and Kagan introduced the ideas—soon to be institutionalized by PNAC—in their July/August 1996 Foreign Affairs essay, “Toward a Neo-Reaganite Foreign Policy.” The article does not single out Iraq for invasion, but the general framework for embracing “benign hegemony” is laid out in no uncertain terms. America must pursue policies “intended to bring about a change of regime” when necessary, the authors state. Today, the crusade launched by that fax machine has gone full circle: from little-known dissident pressure group whose ideas were out of step with public opinion, to supplying the White House and Defense Department with personnel and ideas, to a footnote in American political history whose most famous alumni are again scattered outside of government. With the NCP and PNAC both out of commission, the Weekly Standard is the last of the three neoconservative projects started by William Kristol in the mid-1990s to remain active. If one day the magazine’s website goes down for non-payment, it won’t take multiple phone calls to know the neoconservative idea machine is really in trouble, even more than it is today. *Editor’s note: PNAC apparently resolved its accounting department’s mistake; the website was back online in September 2008.